The minute after I took this picture, I ripped all of this knitting out and started the project over. I’m like one of those Buddhist monks who spend years creating intricate mandalas out of colored sand and then, when they’re finished, sweep them up with a broom or let the wind blow them away. Just kidding. Most of the time I am nothing at all like a Buddhist monk, but lately in my knitting life I’m been almost completely interested in the process rather than the product. This is supposed to be a good thing, but I’m starting to feel that it would be nice to have an end product to give to someone and let them coo over. This project is a large throw. I’m using an easy pattern called “Sweet Scallops” from the Red Heart website, but I’ve never made anything this large before (the first line of the pattern reads “Cast on 225 stitches.” Yikes! ), and I found that it took forever for me to get a sense of what the pattern should look like. 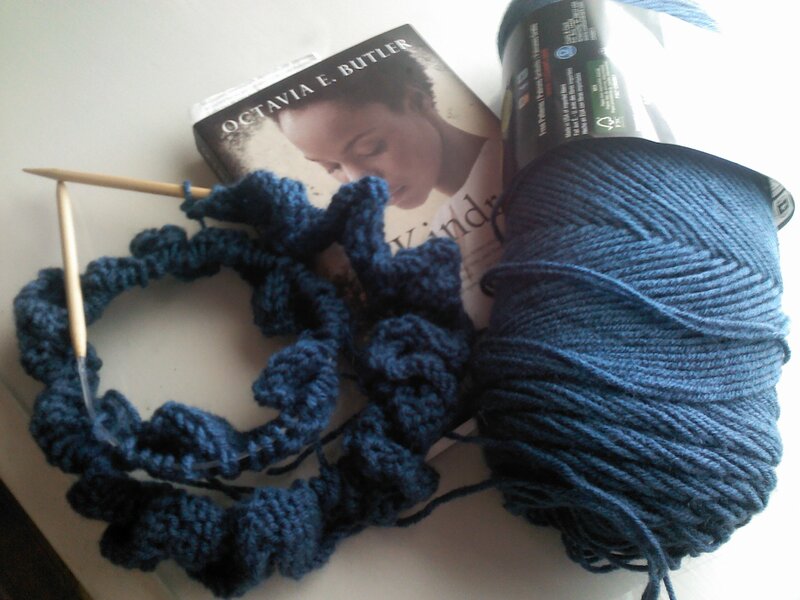 Whenever I work in cables or in some other kind of a pattern, it is relatively normal for me to rip out the work after 12-15 rows – once I really understand how the pattern is supposed to look and feel – and start over. But for this pattern, 12-15 rows of 225 stitches each represents a LOT of time and effort. So I ripped it out early, before I really knew for sure if the pattern looked right or not, and I modified the pattern down to 48 stitches, and then started over. The new piece is the perfect width for a scarf, and so far (after 12 rows) I both love the pattern and feel totally confident that I can start the blanket over without too much stress or wasted time, and I’m also pretty psyched about the scarf. I’m hoping that both of these items will be Christmas presents. I have such a co-dependent relationship with Christmas – even more than most people do, I think. I worry about it all year long. I rehash the many memories of having my gifts laughed at. I make lists and save money and start projects and then – well, then I usually do something lame. There’s no reason to think this won’t happen again this year, but maybe I’ll finish these projects, and then maybe I’ll finish some other projects, and make some purchases and maybe I can feel good about this stupid holiday that is supposed to be all about innocence and rebirth and joy but never is. The book in the photo is Octavia Butler’s Kindred. I’m re-reading it because I plan to start using it with one of the students I’m tutoring. It’s been a favorite of mine for years, and I’m finding it just as good as ever. It’s about a modern-day African American woman who travels back in time to the age of slavery. When I first heard about this premise, I thought that the book could either be really, really good or (more likely, I thought) really, really bad. But it’s great. It’s immediate and scary and tense and complicated and even a little tiny bit post-modern. Since we’re on the subject of Christmas, I’ll put in a plug for this book: if you buy gifts for readers (perhaps especially for teenaged girl and young adult readers), I recommend this one highly. 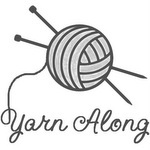 Yarn Along is hosted by Ginny on her blog Small Things. I read Octavia Butler in a utopian/dystopian lit class in grad school. We read Parable of the Sower and I went on to read Parable of the Talents on my own. She was such a gifted writer! I’ve been telling myself for a long time that I should check out her other books. Kindred is the only book of hers that I’ve read, but I’ll bet the others are great.